Kokaistudios has completed the renovation of a historical villa, located in the heart of the city’s former French Concession. The villa was transformed into the home for a Shanghai-based Haute Couture brand, Grace Chen. The project encompasses the architectural renovation and interior design of the villa, as well as a new glass pavilion display and event space. Taking inspiration from Grace Chen’s beautiful and intricately crafted clothing, Kokaistudios developed a design strategy that is feminine and elegant, yet completes the classic design of the villa with a touch of modernity. Kokaistudios embarked on an architectural restoration of the building that valorized the villa’s original features, including the French doors, the inlaid marble mosaic flooring on the upstairs terrace, as well as the beautiful facade brickwork. The entrance to the villa is marked by a large black and bronze weaved metal gate, the design of which was inspired by one of Grace Chen’s designs. It provides privacy, coupled with a strong sense of arrival. The villa overlooks a courtyard that was completely re-designed to meet the client's needs, functioning as an event space and an area for hosting small fashion shows. The architect divided the villa into a series of areas, with a progression from the public areas on the ground floor to the most private areas on the third floor. The ground floor hosts the main showroom and lounge area. The show-kitchen and dining area has direct access to the courtyard. The fitting rooms and offices are located on the second floor. The architect settled on a palette of colors and a range of natural materials, together creating a comforting environment that acts as a supporting backdrop to the client's beautiful couture creations. While much of the custom-made cabinetry and display mirrors were designed in a style to complement the historic nature of the villa, the architect chose to contrast them with features and finishes that were intentionally modern. The interior space uses furniture and fixtures from noted domestic and international producers, such as pieces by Flos, and Murano glass lamps designed and produced in Italy by the family of Filippo Gabbiani, Chief Architect of the project. The third floor is taken up by the intimate library as well as the VIP suite for out-of-town guests. Exposed bricks were finished in a simple dove grey paint, giving the space a more unfinished feeling. This intimate and elegant space is an area for reflection and exchange, envisaged as a “salon” of old times. An adaptive reuse of a historical building in Shanghai China, The Living Room is built to create walkable, mixed-use alternatives to China’s rampant urbanization. The center is a hub for services including family therapy, art therapy, yoga, a health-oriented restaurant with food and beverage programs, and a small-scale urban farm. The interior was designed by noted New York architect and designer Calvin Tsao of Tsao & Mckown. Shanghai-based architecture firm, Neri & Hu, designed the exterior of the building. From the venue: The Living Room by Octave is our flagship wellbeing center offering integrated and customized wellness programs delivered by a group of world-class practitioners. The exterior was designed by Neri & Hu and the interior was designed by noted architect and designer Calvin Tsao. It also houses a gourmet, organic, natural restaurant, Thought for Food, and a Children's Enhancement Center for kids ages 6 months to 3 years. Our facility is located on Jianguo Xi Lu in the heritage area of Shanghai, and is equipped with advanced air filtration which cleans up to 0.002 μm PM2.5. We also have running water reaching international quality standards. Located in close vicinity to Beijing International Airport, Luo Hong Art Museum is China's largest personal photography art museum. As the President of bakery chain Holiland, Luo Hong has devoted much of his time to photographing wildlife. He was named a “Climate Hero” by the United Nations for his contributions to raising public awareness on the importance of environmental protection. ZUCZUG/ is a fashion brand that pursues individualism and equality with its original and comfortable clothing. AIM Architecture upholds these values with the clean, simple, and elegant design of the brand's new store in IFC Mall, Shanghai. Natural wood patterns on custom-designed furniture compliment the simple clothing styles. White ceramic tiles provide a neat and unobtrusive backdrop. The store is located in IFC Mall, Pudong, Shanghai. The first of its kind in Shanghai, The Clinic, is a wellness, and rehabilitation center focusing on each person's individual needs. The design from Hannah Churchill of hcreates aims to create an interior that overturns ones idea of the "sterile white walled" hospital environment. Raw materials of concrete, rustic wood, textured glass and industrial lighting have been used to create a intimate boutique style to the common spaces and treatment rooms. The minimalistic and natural finishes give suggestion to a spa interior to instill a feeling of relaxation and healing. Hidden in a deep lane in Shanghai, the Michelin-starred restaurant Taian Table is a small and intimate dining destination with an open kitchen and an ethos that based itself of a single, seasonal tasting menu. In 2017, it relocated to the current venue. Interior design by Shanghai-based architecture and design firm, A00. 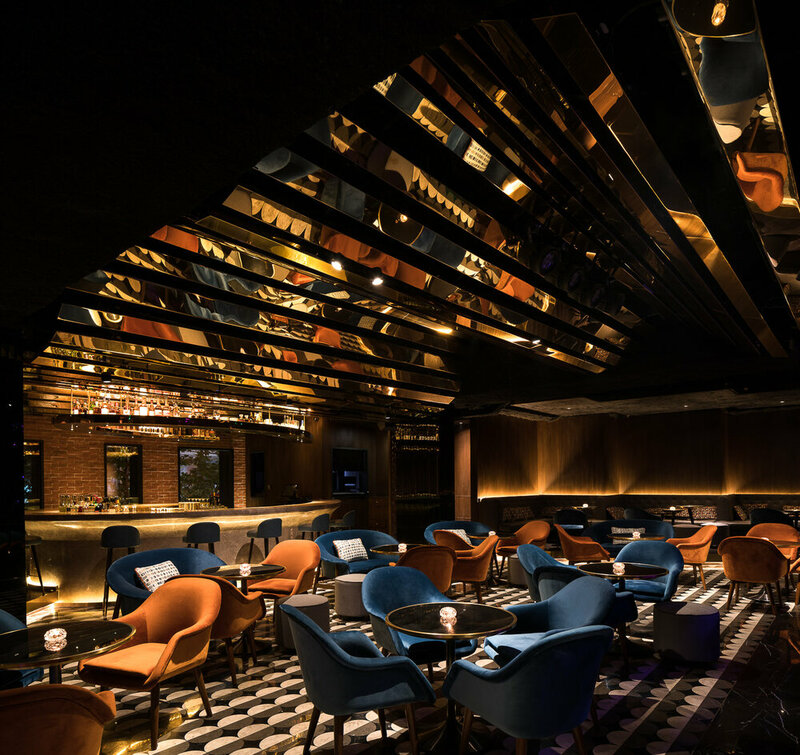 Located in the center of Shanghai, Shake is an upscale venue dedicated to soul music and to bring excellent food and beverage experience to the city. Taking inspiration from the style and the energy of 1960s, Kokaistudios created immersive and memorable experience for guests as if stepping back in time when walked in the door. Designed by Studio 1:1, Y+ living yoga center Xintiandi branch is equipped with five yoga classrooms, including an aerial yoga classroom. The main studio has a capacity of 150 people. Floor-to-ceiling windows plus high windows on the roof allow plenty of natural light to come into the space, adding bright accents to the minimalist style. Simple and smooth curves are strong features of the design, exemplified in the reception area as well as the corridor. Cobra Lily is a Pan-Asian restaurant and bar in Xintiandi, Shanghai. The design centers around a mysterious femme fatale, and is a journey through her day and the places she hangs out. The original early 1900's decorative Chinese archways have been kept, creating a secret alleyway. Opening into this alleyway, you discover the bar and lounge area. A two-story atrium complete with a floating DJ booth creates a dramatic entrance. Lounge and dining areas sprout from the first floor, forming intimate pockets of dining space. Modern wall sconces lead diners onto the more open areas on the second level. Upstairs diners nestled in the top of the atrium look down over the lounge and bar area. The bathrooms are positioned at the end of a long dark corridor with secret agent themes. Raw concrete mixed with sleek finishes create an upmarket urban chic in a relaxed setting. Located in the heart of the Former French Concession in Shanghai, Osteria de Gemma is an intimate Italian restaurant that focuses on pasta. Natural finishes and earthy color furniture together create a warm ambiance for diners to enjoy the featured Italian dishes. Designed by Hannah Churchill of hcreates.